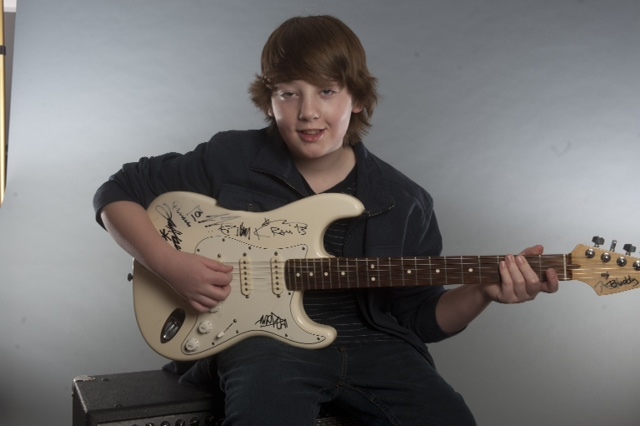 Twelve-year-old Quinn Sullivan knows how to handle a guitar. That’s why blues legend Buddy Guy has appointed him to be the opening act for his current tour. As a New Bedford native, Sullivan said he thinks their upcoming performance at the Zeiterion Performing Arts Center on Wednesday, August 24, will be special because he’ll be back in his hometown with his loved ones. In fact, the two guitarists met at the historic theater five years ago when Sullivan was eight. He went to see Guy perform and they were introduced after the gig. Shortly after, Guy contacted Sullivan and requested that he join him for a few shows. By the third performance, Guy asked him to appear on his Grammy-nominated album, “Skin Deep,” which was released in 2008. “I played the solo played on, ‘Who’s Gonna’ Fill Those Shoes,’” Sullivan said. To repay the favor, Guy performed on one of Sullivan’s songs, “Buddy’s Blues,” which is featured on his 12-track debut blues-rock album, “Cyclone.” It was released in early spring of this year and produced by Tom Hambridge in Nashville, Tennessee. Another thing that Sullivan thinks is “awesome” is the fact that he finished sixth grade just a few months ago and is now on tour with Guy. This summer, he said he is enjoying the opportunity to travel the United States and visit venues he’s never been before. In particular, Red Rocks Amphitheatre in Colorado and Hollywood Bowl in California were the biggest highlights of his journey so far. He also liked a few clubs in Chicago. During the last four years, Sullivan and Guy have played together more than 30 times. On this tour, he’ll open for Guy at about 20 concerts and will also play a handful of solo shows. But, Guy isn’t the only well-known blues guitarist Sullivan has rubbed shoulders with. In February of 2009, he performed with B.B. King at the Beacon Theatre in New York City. Someday, he hopes to expand his already incredible resume. He hopes to play a show with Eric Clapton. In addition to Guy, King, and Clapton, Sullivan has been heavily inspired by other blues and rock musicians such as the Allman Brothers Band, Derek Trucks, and Pink Floyd. The Beatles are among his favorites, too. He can also play the drums, some keyboard, and a little bass. But, when he’s not busy being a young celebrity, as he has been featured on The Oprah Winfrey Show; The Ellen DeGeneres Show; and Jimmy Kimmel Live, Sullivan said he likes hanging out with friends and playing tennis and basketball. Sullivan will continue to tour with Guy for the remainder of the summer, through the spring. In that time, he plans to finish up his second album. Tickets for the show are on-sale now by phone (508-994-2900), online, or in person at the box office. The Zeiterion’s box office is located at 684 Purchase Street, New Bedford, MA 02740. Box Office Hours: M-F 10 a.m. to 5 p.m., Sat 10 a.m. to 3 p.m. and one hour before each performance. For more information, visit http://www.zeiterion.org.